SAN JOSE — City leaders Tuesday agreed to buy six pieces of land near Google’s proposed tech village for parking and road improvements despite concerns from some residents that taxpayer dollars are being spent to subsidize the tech giant’s private development. Mayor Sam Liccardo stressed that the land acquisitions approved Tuesday will support improvements that were planned for decades — with or without Google’s proposed tech campus. Liccardo also said the money pegged for the land buys — about $15 million total — was allocated years ago and that $4 million came from Trammell Crow, Google’s development partner. The San Jose council unanimously approved all the land buys Tuesday. The $4 million from Trammell Crow, which went into a general city parking fund, stems from a 2016 lawsuit settlement. The San Jose Sharks’ parent company sued the developer and the city over a retail and office tower that would eat up 835 parking spaces near SAP Center. Sarah McDermott from UNITE HERE, Local 19, a union that represents service workers, was among critics who questioned the decision. Five of the six parcels are at the northeast corner of West St. John and North Autumn streets. The seller is the Milligan Family Trust, and the parcels are collectively known as the former Milligan News site. The land appraised for $9.9 million in October 2016, but the owners made a counter offer to the city for $11 million — which was approved Tuesday. One residential and two commercial occupants would have to be moved, according to city documents, costing about $400,000. That land will be used to replace Autumn Street between West St. John Street and Julian Street with a new roadway that completes the connection between 1-280 and Coleman Avenue. The Sharks lease a portion of one of those buildings, city documents show, but will remain on site until the building is relocated. The sixth parcel of land, located at 525 West St. John Street, is owned by the Francia Family Trust. San Jose leaders agreed to buy the property for $2.9 million on Tuesday, using the money from the Trammell Crow settlement. The plan is to use that land for parking in an effort to fulfill the city’s agreement with the Sharks. 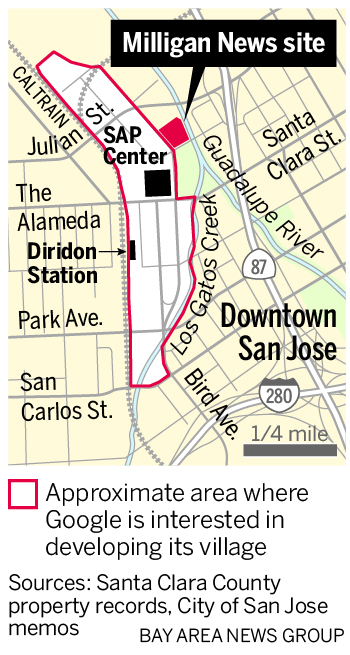 It can also serve as an interim supply of parking during the planned construction of the BART and High Speed Rail, city officials said Tuesday. Though the property was appraised for $2.3 million, San Jose leaders agreed to buying it for $2.9 million partially because of what’s being dubbed the “Google effect” — land near the proposed development has skyrocketed in value. But labor leaders and housing advocates said they’ve been excluded from the city’s private negotiations with the Internet giant. No official community meetings have been scheduled to talk about benefits Google might offer the city, they said, but the city keeps buying land near the project. The source of funding for the former Milligan News site, according to city documents, is a building and structure construction tax fund. The Francia Family land will be purchased using money from a city parking fund — comprised of Trammel Crow’s settlement.